Did his advice to his daughter strike you as it did me – as hugely counter-intuitive and counter-cultural? We’re all – all of us – about answers. And authority figures – in this case a dad (but it could have been a boss or a college prof!) – give answers. One reason – a dirty truth we hardly tell ourselves – is that authority figures are invested in their players or children’s or staff members looking good; because we are afraid we will look bad when they look bad. 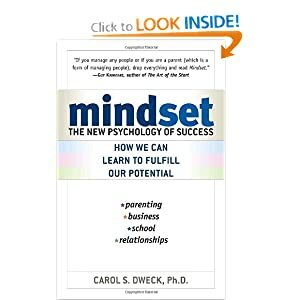 The fixation on “right answers” and that “it’s not okay to leave it blank” generates what Carol Dweck in a fascinating book called Mindset identifies as a “fixed mindset.” In her fascinating view some people think things like athleticism, greatness, intellect, musical ability are fixed. You have them or you don’t. And so these people (or maybe I should say “we” because I suspect we’re all at least a little bit this way) must always be proving they have it; you can’t gain it, after all; you have it or you don’t; so the stakes are always high. Modeled for her that he’s not desperate that she “get it” immediately; he’s showing his identity is not caught up in her getting every answer right. Too many kids are carrying their parents’ desperate hopes; it’s enough for them to fight their own battles! Helped her (and pushed her, perhaps) to be resourceful about getting answers, a key to creating independence.